Dream. Dress. Play. : Make It Monday! 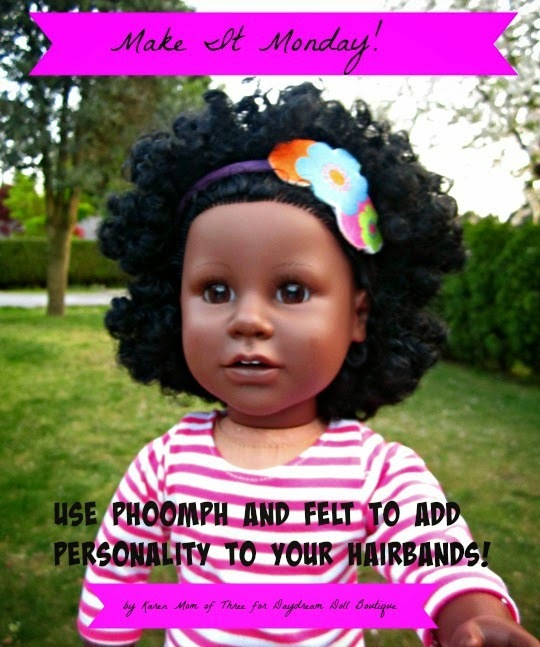 Use Phoomp and Felt To Add Personality To Your Hairbands! Make It Monday! 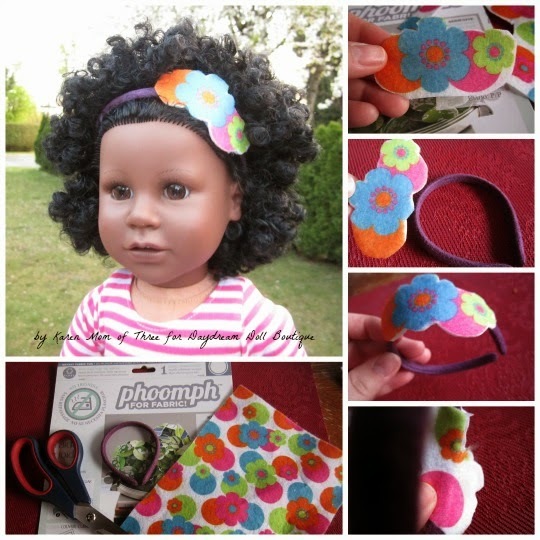 Use Phoomp and Felt To Add Personality To Your Hairbands! Karen here and my order of hairbands from Punch Place Plus arrived and I could not wait to share this craft idea with you! Punch Place Plus sells packages of wonderful doll hair bands that you can use for your own doll or purchase for a party craft! Step 1- Assemble all your supplies. Cut out your shape and pattern from your felt. Step 2- Cut out a piece of Phoomph that is a similar size to your felt shape. Step 3- Cut out a second piece of felt that is the same size as your Phoomph. Step 4- Peel back one side of the Phoomph paper exposing the sticky side and place 1 cut out shape of your felt on top with the pattern side up. Step 5- Trim around your shape as shown in the photo above. Step 6-Cut a the other piece of felt the same shape as the Phoomph covered piece and place it aside. Step 7- Decide where you want to position your shape and peel the backing off the other side of your phoomph and stick it in to place. Step 8- Use the other piece of felt you cut and stick it to the other side pattern side out on the opposite side of your hairband. This covers any sticky parts. Press down along the seems and place in your dolls hair.